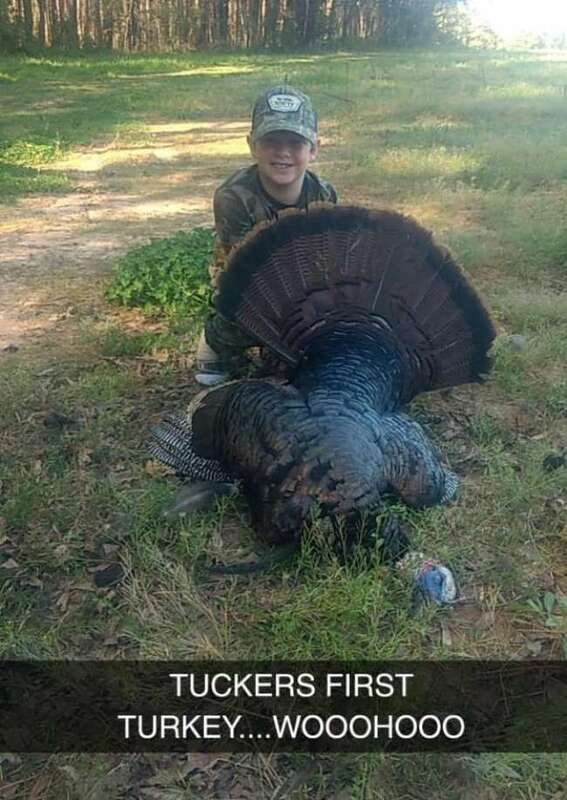 Yesterday my ten year old son Tucker bagged his first gobbler. We live in Warren County and he has been hunting for a few seasons now, but has never been able to get on a bird. Yesterday after school, his step dad asked him if he wanted to go across the farm and see if they could scout out any turkeys. Since my son is much shorter than his 6 foot 4 step dad, and struggles to keep up, he said yes and jumped on his bicycle and took off in his flip flops. As they approached the fields, they crept through the side of the woods and spotted a gobbler with a hen. They set up a decoy and hunkered down at the base of a pine tree...and called...and waited. Finally the gobbler caught sight of the decoy and made his way across the field. Of course it could not have been as easy as the bird coming directly to the decoy...he detoured through the woods and made the guys call even more...until he finally popped back out and was blown up in full strut, making a bee line for the decoy. As he approached, Tucker said he started shaking and was nervous...his palms were sweating more than they ever have. He lined up the shot and kept whispering can I shoot now, can i shoot now...until he was finally told SHOOT! and boy did he shoot. After a few flops the turkey was bagged. I am not sure who was more excited, my son or his step-dad Preston, but you can tell by the pictures and his bright smile that he was one excited boy!